International Eucharistic Congresses entered the mainstream of Catholic life in the 1880s. They have played a huge part in spreading the Church’s social teaching;promoting early and frequent Communion; championing the Kingship of Christ; encouraging the worldwide mission of the Church; supporting the movement for peace after two world wars; deepening understanding and love of the Eucharist. The countries which have hosted these Congresses have been the first to benefit. Delegates from other countries have also taken valuable lessons back home. Nothing substantial however has been published in English to inform the general reader about the rich treasures offered by all these Congresses. 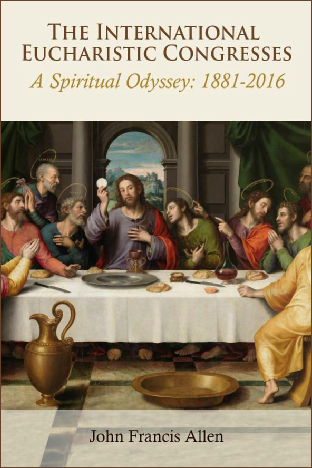 this subject, so essential to the Church’s Eucharistic tradition. Christ the Bread of Life and His Mystical Body, the Church. after studies at the Venerable English College and the Pontifical Gregorian University in Rome. has attended all twelve of the International Eucharistic Congresses since 1973.